Relationship therapist Sonya Rhodes's liberating, straight-talking guide convincingly argues that successful modern women—the audience who embraced Lean In—can find the right guy without having to change or settle, and tells them how to do it. In the twenty-first century, women are outpacing men in education and career advancement. Yet amazingly, successful women constantly hear that their professional achievements doom their chances of marriage and family. Don't believe the alarmist hype, advises top relationship therapist Dr. Sonya Rhodes. Today's Alpha women—ambitious, self-assured, and hardworking— aren't going to end up lonely spinsters. They don't have to settle for Mr. Good Enough. 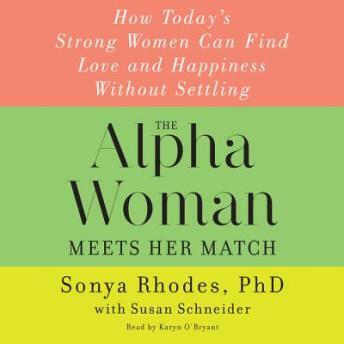 Echoing Sheryl Sandberg's powerful message, The Alpha Woman Meets Her Match shares the secret necessary to triumph in love and work: find the right partner. It can be done—and Dr. Rhodes has the tools to help. Going beyond value judgments associated with the terms Alpha and Beta, she advises women to look past the overly competitive, domineering Alpha male for a man who's in touch with his inner Beta qualities—someone who is communicative, responsible, thoughtful, and collaborative. Demonstrating that most people are a combination of both sets of qualities, she includes a revealing test to help readers define where they (and their partners) are on the Alpha-Beta spectrum.